Boston 2014! Or what it’s like to run the best race of your life. I’ve been trying to write this post for nearly 2 weeks now and I just cannot get a handle on the angle I should be taking. Should I tell you about all the great stuff I did with my mother? About all the wonderful friends I saw and spent time with? The superstars I collared for a photo? Or just the race? I think I have to start with the race. Because it was a truly one-off experience for me. 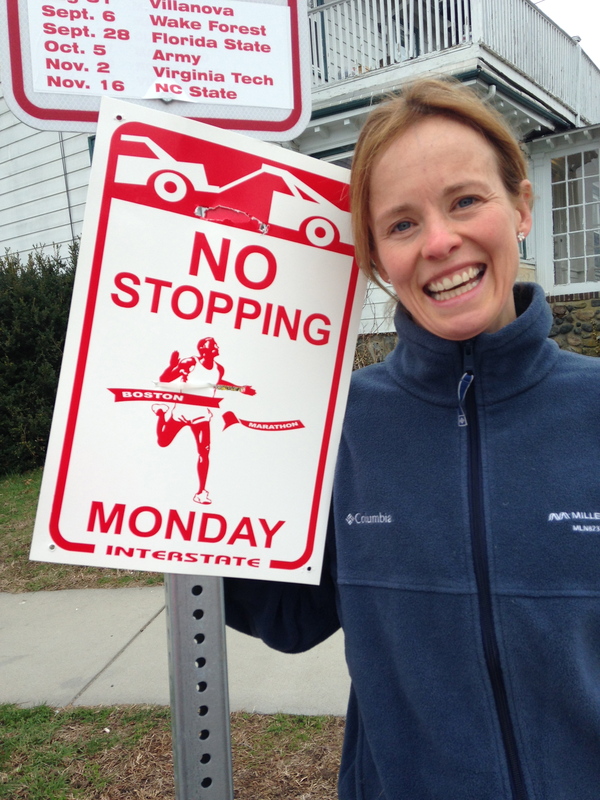 April 21st was a gorgeous day, and, in Shalane Flanagan’s words, an “honest day”. No massive tailwind, no perfect cool running weather – a race run under fair, even warm, conditions. Hanging around in the Athlete’s village with my friends, it had gotten warm enough to throw off my warmup clothes and by the time I made it (just in time, thanks to massive queues for the portapotties) to my starting corral, I was thinking I shouldn’t have worn my arm warmers. Walking through Hopkinton on my way to the start (it’s a long way from the corral to the start line) I contemplated my coach’s strategy (8:20s for the first 13 miles, 8:30s for miles 13-17, 9 minute miles for 17-21 and then whatever was left in the tank) but I also knew, with real conviction, that this was a race I wanted to experience and remember. For the past few years I’ve chased PBs in my marathons and while there is enormous satisfaction to achieving a PB you’ve worked so hard for, there’s also a relentless focus required, a constant checking of the watch, blocking out spectators and other runners, concentrating purely on getting to the finish time without the wheels coming off. I had had a pretty discouraging running training cycle going into this race (a 20 miler which took me about 4 hours and lots of changing of insoles due to really painful plantar fasciitis and a 17 miler which was a 20 miler cut short because I completely ran out of steam) and before the race I remember telling somebody that if anything, my biking was finally turning a corner. I knew the marathon was NOT my end goal and that took a massive amount of pressure off – I would bear the goal in mind but nothing would stop me from really enjoying the race. And then the race began. Bear this in mind, I’ve run Boston before. I have run London (twice), NYC, Berlin and Chicago (twice). I know what big city crowds can be like. But this – this was something else. This was personal. The crowds wanted you to do well, to run strong, to show the world that Boston was indeed Boston strong, that we could claim this race back from those who had tried to destroy it. Within a mile or so of starting I was convinced that soaking up the race was the purpose of the day. I made myself, mentally, stay within each mile. Whenever I felt myself flagging, or counting what lay ahead, I just ran along the side and got some love from the crowd. I high fived dozens of kids, and even a dog. I shouted out at people who had great signs, I clapped for the crowds. At one point a woman running next to me said “What makes you so famous?” because so many people were bellowing my name – I told her it was because I had my name on my shirt. For 26 miles I heard “Petra, you’ve got this!” and “Petra, you make us proud”. It was utterly humbling and deeply moving. I saw nuns cheering us on in their habits and ran to the side to wave at them – one started jumping up and down and shouting my name. At Wellesley I stopped and kissed 3 girls – this was the day for it! 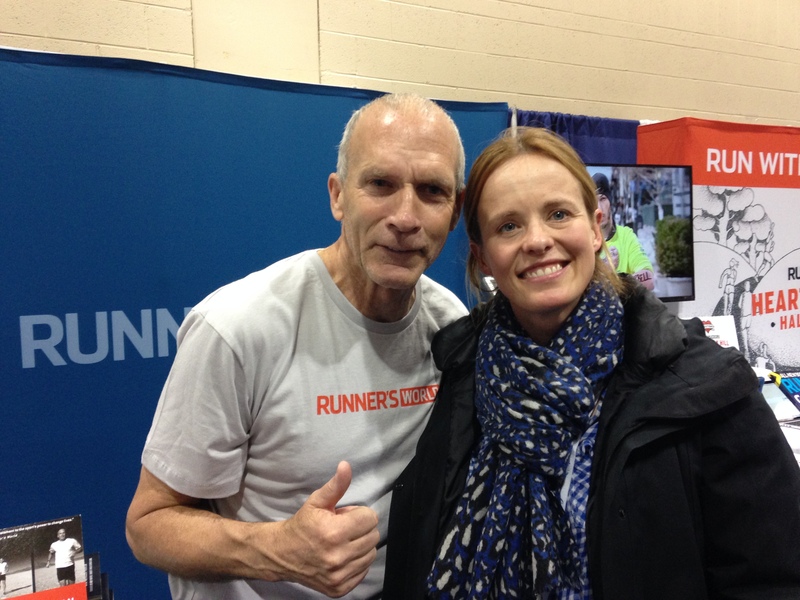 I saw my coach – exactly where she said she would be! – and stopped and hugged her. 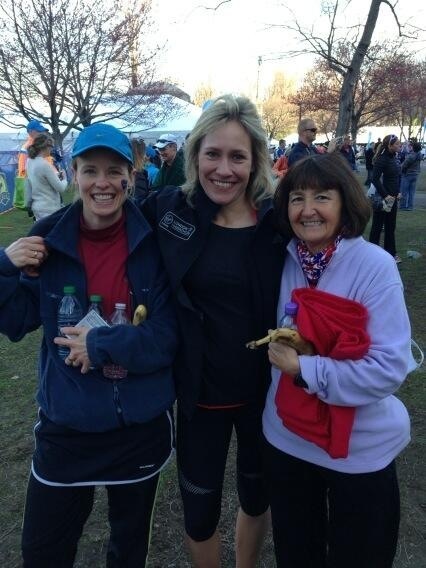 I saw my mom at mile 21 and stopped and hugged and kissed her. I loved it. And as I ran into Boston the crowds just got louder and crazier. The love, the love, the love was intense and I felt completely and deeply emotional to be allowed to be part of this. And then I turned onto Boylston street and where I’d worried I’d feel apprehension or sadness this was now impossible. The noise and the sunshine and the cheering just drove me towards the finish line – I found myself never wanting it to end. And then it did. As soon as I crossed the finish line I realised I could now barely walk. Limping along to the luggage trucks on Boston Common, I was just overwhelmed with what I had just experienced. Because not only had I immersed myself in this incredibly emotional experience, but I had also run the whole race completely under control, exactly as the coach ordered. 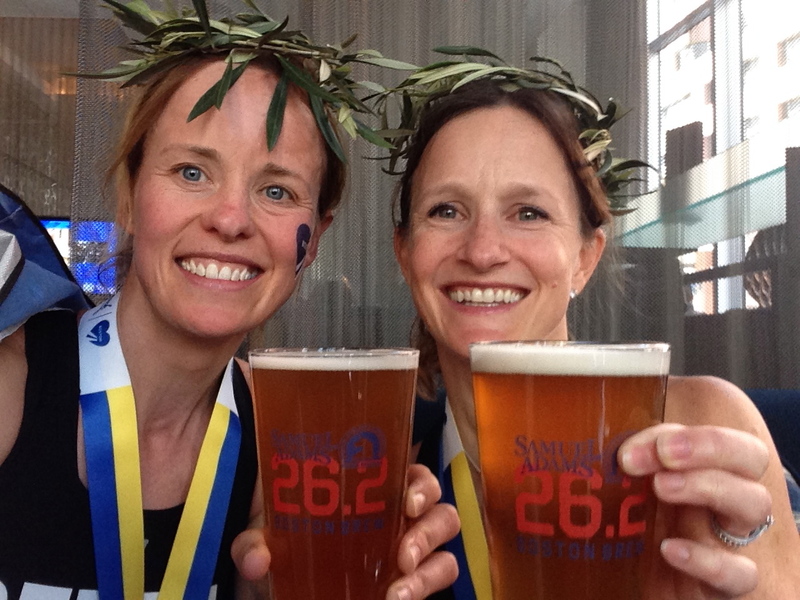 And had come in at 3:44:27 – my 3rd fastest time ever and a (very tight) Boston qualifier. For once, it felt like I had done everything right. I had walked through the water stations every few miles, drinking plenty of water and pouring some over my head to cool myself down, I had chugged down a gel every 30 minutes and hadn’t even considered whether I wanted to or not. I had slowed down up Heartbreak Hill but had found it within myself to speed up again as soon as I crested it. At times I had been conscious of my watch beeping but I hadn’t even registered the mile splits, or the average pace window – had only looked to see if I needed to take another gel. Where in the past my increasingly addled brain would have been working out potential finish times and how hard I’d need to run to get to my goal, the only calculation I can recall making during this race was that I’d probably be done with the race in an hour and that I needed to really enjoy what was left of it. So different. So wonderful. I’m not sure whether I managed this because it was just one of those days where everything aligned for me. I think it helps that I am training for a different race and that Boston was never the ultimate goal for me. I think it helped that this, of all the races I’ve run, was such an emotional race. 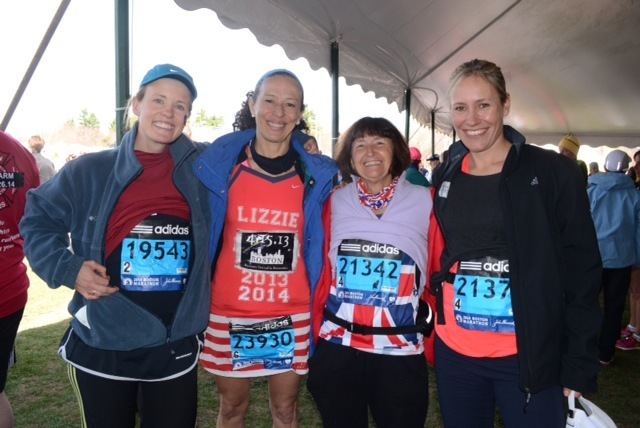 It helped that I spent so much time with friends before and after the race. I was so immersed in the atmosphere of this race that for once, my brain was not sitting on top of my body, second-guessing it, and driving me along and, occasionally, sabotaging the job my body is meant to be doing. My brain and heart were out there experiencing the race, while my body got on with the job it had to do. I’m not sure I can ever replicate this feeling or experience but it has made me hungry to race more like this – to really experience the race, to not retreat into a pain cave or an isolation zone. This might mean accepting slower times – though this result does not suggest that – but I am eager to try this again. And then there’s all the other stuff. The stuff that made me never want this week to end. The people. Here it is – the week in photos. 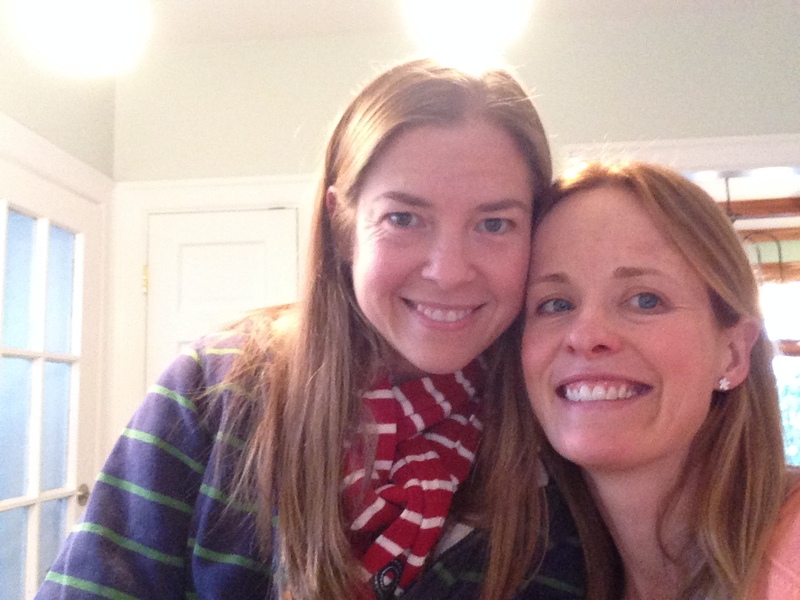 Jess – my wonderful hostess upon arrival in Boston. Lovely friend, lovely family, beautiful house – first of many visits to and fro between here and Boston I hope? Boom! 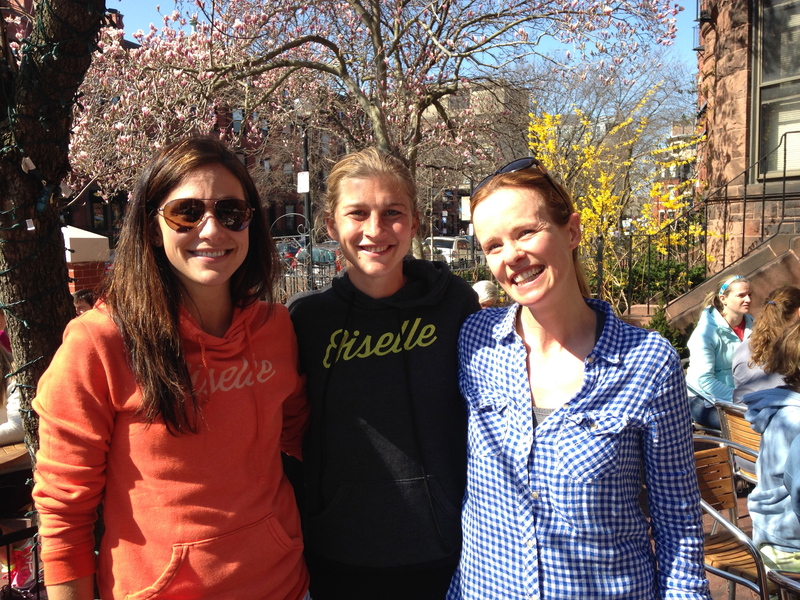 First brunch outside with my mother and running buddy Ben and who’s at the table next to us – Kara Goucher and Lauren Fleshman, only two of the most awesome women in running today! Finally! The lovely and generous Bart Yasso! What an honour! 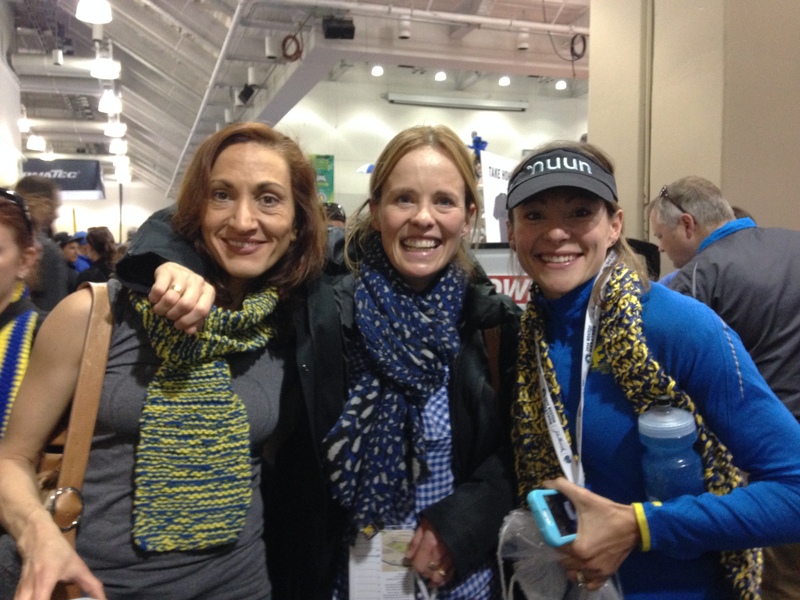 Finally – after years of admiring these women and their amazing blogs from afar I met up with Ana Maria and Amanda. Such gorgeous, kind and inspirational women. 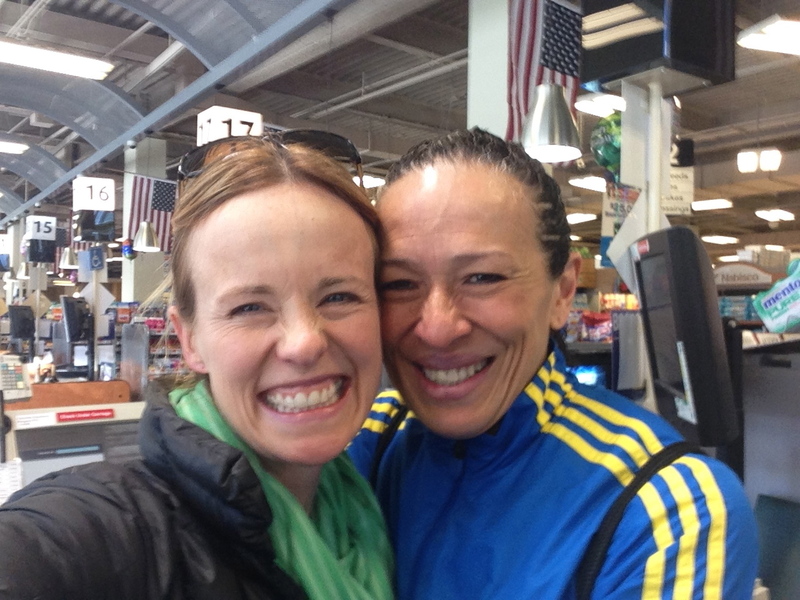 Lizzie Lee and I nearly in tears after meeting up after 7 years of online friendship in a supermarket queue! Waiting to get on the buses with my friends Sophie and Jacquie. Sophie was interviewed for the BBC News while we were waiting and I featured briefly in my homeless person’s throwaway clothes. Nice! The lovely, speedy and beautiful Kristen. Lucky, lucky me that she made the effort to limp here after the race! 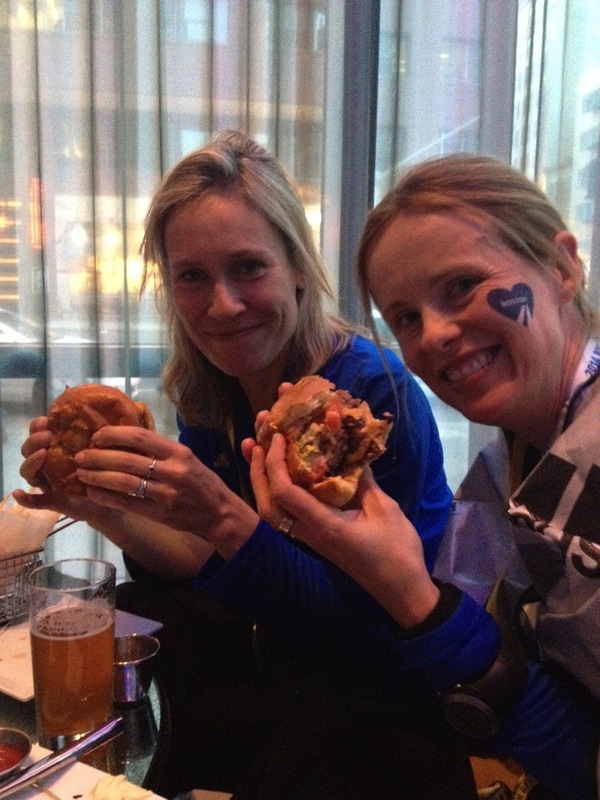 Has a burger ever tasted this good? 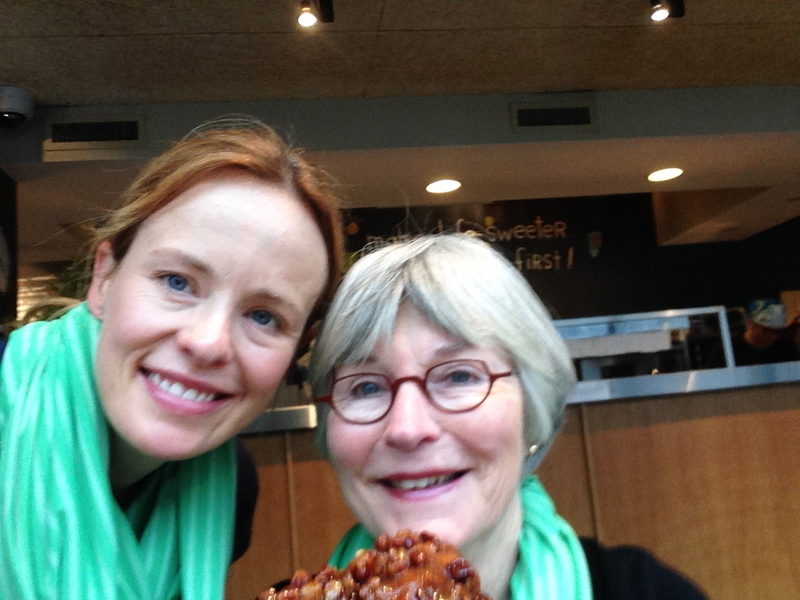 And last but absolutely most wonderful (in our matching Oiselle scarves) my incredible mom. Thank you for being there lovely mama! I’m back at it, I’m back out there. Boston was never the end goal and I’m back on the bike, in the pool and on the road. But this race will never leave me and will forever be special in my memory – the city, the people and my friends and family. Thank you Boston – I will never forget it. Next Post 5 weeks to go! Woohoo! I hope my marathon in TWO WEEKS (EEK) will be half as fun as this sounded. So, congrats to you and that was an amazing time for someone that wasn’t even trying. 2 weeks! I need to catch up on your blog! Yes it was an amazing experience! I don’t think this will happen like this again for me so I made the best of it. Can’t wait to see what you think! I sent you an email about my available times. I’m hoping we make this happen. That sounds awesome! 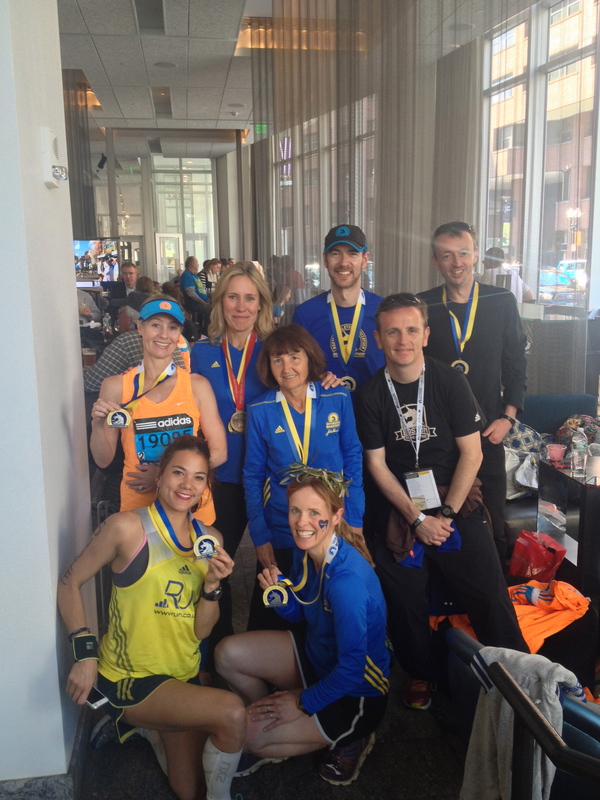 I would love to qualify for Boston, it is my favourite city in America (we had an apartment on Boylston once – just by where one of the bombs went off). Sadly I don’t have the time to put in enough training – but I can dream of a fluke qualifying time one day! I am utterly happy for you…this post, this post, this post showcases your exact happiness. I couldn’t be smiling any bigger for you!! Love you, lady! We will do a race together one day, I know it! Now carry these feeling into the next round of training and go full throttle for that IM. I know you can do it! I’m a little late to the party, but I just wanted to congratulate on your fantastic race! And a BQ at Boston?! Totally rad. I so enjoyed reading your race report too.